Based in London, Livedrive is a company with over a decade of experience in cloud storage and it focuses on offering a fast, reliable solution for customers around the world. They support a large customer base around the world and it aims to be the most complete and effective solution to secure data and ensure that it is accessible whenever it is needed. In this review, we will take a closer look at what Livedrive offers so that you can decide if it suits your needs. Livedrive chooses folders automatically to start the backing up process. In the settings, you can add more options at a later stage. The setup is simple and fast and once it is completed, you will be able to start backing up data to the cloud. The interface is easy to use and it offers a simple option to manage your account and to get an overview of the status of current backups, including information like the total amount of data uploaded. You can also see the data backed up on all your computers. The main functions available are Backup and Briefcase. The first one focuses on basic backup and in the Briefcase window, you will have the possibility of adding folders and uploading files to your account. The data will be synced to all the devices that are running Livedrive. Livedrive’s Backup plan has a solution that is specifically designed to help you to backup data easily and without limits. This basic plan known simply as Backup, provides an unlimited backup for €6 per month and it supports all your computers (Mac or Windows), but it is not designed for mobile devices. The Briefcase plan is the ideal choice if you need to access your files on the go. It provides 2TB of space that you can use for storing your files in the cloud. Users of the Briefcase plan can also sync data between their devices and share their files with family, friends or colleagues. The mobile apps will allow you to watch your videos or enjoy your music, no matter where you are. Briefcase lets you access files on any devices connected and every file you copy is saved in your Livedrive account for easy access. The Briefcase plans starts from €10 per month. Another option for Home users is the Pro Suite plan, which gives you unlimited backup for up to 5 computers. It includes the syncing capabilities of Briefcase and you get 5TB of cloud storage space. This plan starts from €17 per month. There is a free trial available for every plan that allows you to test the service for up to 14 days. Livedrive also offers Business plans for users with advanced requirements such as central admin management. Livedrive’s software is designed to offer a good experience and to make things simple. The set up only takes a few steps, although the initial backup can take several minutes to complete. The good news is that you can continue working on other tasks in the meantime. While Livedrive can select data to backup automatically, you can also select the files that you want to back up manually. All the files that are backed up will be uploaded to your online account. The regular backups will include the data from the initial backup and you can add new folders to the backup task. Backing up a folder is easy as you just need to right-click the context menu in Windows Explorer. The backup solution only supports folders, meaning that you won’t be able to select individual files. It is also important to note that some file extensions won’t be added to the backup task. Cookies, temporary files and virtual machines are excluded from the backup process. Livedrive keeps up to 30 versions of a file, so if you need to keep older versions of the data, you may need to look elsewhere. Files deleted from your computer are kept in Livedrive’s servers for up to 30 days. Data is backed up every hour automatically. However, you can only scan folders on a set hour, or back up new data daily at a specific time. In addition, Livedrive doesn’t support continuous data protection. The backup process can be paused in case it is taking too long, or if you have changed your mind and don’t want to backup certain folder. In terms of speed, Livedrive offers good performance, but the results will vary depending on your connection and your computer. You have the option to manage the amount of bandwidth used and set upload and download limits, although it is set to unlimited by default. You can also exclude file types and specific folder from the backup. There are no file size limits when you upload data via using the desktop software. However, there is a 2GB limit when you upload via the web interface. To protect your data, Livedrive uses 256-bit encryption. However, you should keep in mind that they hold the encryption keys and can decrypt your files if needed. They don’t offer an option to set your own encryption key. Since Livedrive operates from the UK and it also has presence in United States, it is under the jurisdiction of surveillance agencies like the NSA and the GCHQ. If privacy is a top concern for you, this is something to consider. Livedrive’s website offers helpful information about the service and the features available. Customers can get access to dedicated support through their accounts. It is possible to access an extensive knowledge base and to create a ticket, which would usually be responded within one business day or less. The support hours are Monday to Friday from 9 to 6 pm, UK time. They also offers assistance via email. With Livedrive, you will be able to enjoy powerful and efficient backup features and a good syncing experience. The mobile apps offer great quality and they give you the possibility of playing videos and accessing your files on the go. While some advanced features come with an additional price, the basic plans are designed to provide flexibility to protect your data and ensure that you can access it whenever needed. 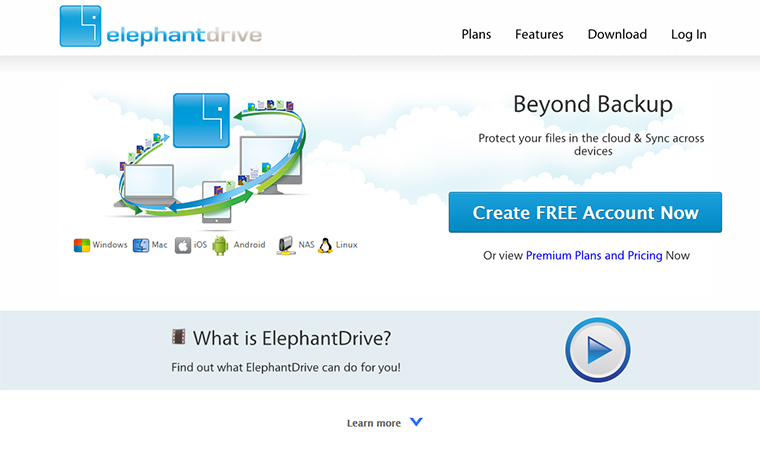 You can opt for a standard backup plan, or select an option that offers file syncing and sharing features. The main downside is that the level of privacy is not strong and they have the power to decrypt your files.